Paying more for the right business location will be a good investment especially where retail outlets are concerned. 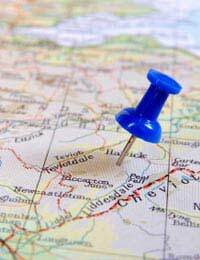 What actually constitutes the right location will be dependant on your type of business. A prime spot in a busy area will demand higher rental rates whereas businesses located on the outskirts should see a drop in rental rates. The importance of the business area should be fairly obvious. If you are a small shop selling clothes or food you will either want to be in the centre of town or on a busy local street. Businesses that do not have much contact with consumers can be located practically anywhere but there are other considerations. Access to the business for staff and suppliers can be a factor if you are considering premises that are not central or close to central. Another factor to consider when choosing premises is the competition. There is no point setting up a shop in the nearby vicinity of a competitor. In some cases there may be leasing regulations or council rules prohibiting setting up next to a competitor. Setting up next to a competitor will only cause bad feeling and can result in an unpleasant price war as each business tries to undercut the other. It’s a simple fact that if you are a retailer selling directly to the public a prime location is a requirement. Commercial properties in the centre of town with easy access for the public can demand considerable rates. New premises such as shopping malls with a variety of shops can demand staggeringly high fees, even for a small unit. Negotiating prices will not always be possible for prime locations. But the rewards can be substantial in terms of customers and profits, especially if there are rules regarding prohibiting competitors in the same area. The internet has seen a huge rise in home shopping, and for some businesses it is there number one marketplace. Virtual locations eliminate the need for large premises, if they are needed at all. All that is required is a professional website, a good communications system and online payment facilities. Home shopping should be considered by every business even if the business does have its own premises that are open to the public. It is important to go through all of the terms and conditions set out in the leasing contract. In many cases rent free periods can be applicable, if not then this may be achievable with some smart negotiating. Find out exactly what is covered by the landlord in your payments and ask to see the customer service charter. Also check the terms and conditions regarding breaking a lease early and terms on rent increases. Never let the landlord set all of the rules; contracts should be negotiated, and if any term is biased towards the landlord then always negotiate. The right location can bring great rewards for businesses that sell directly to the public, and paying more should be an investment. When considering your premises always take advice from business advisors and enterprise agencies. Enterprise agencies may be able to supply grants and funding that will help towards the cost of premises. Never jump into signing any contract whether it is renting or buying premises without taking the proper business advice.